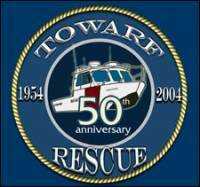 Auxiliary unit Towarf (Town of Oakville Water Air Rescue Force) is embarking on 50 years of excellence. In celebration of a half century of continued service and camaraderie, the unit will be having the event of a lifetime. On Monday, August 2, 2004, Towarf cordially invites all members, families and friends to join in this monumental occasion. Fifty years contains volumes of history, all of which has been written and recorded in a book entitled 50 Years of Excellence, which will be available in the next few months. For more information, visit Towarf´s Web Site.